Laura Harms' challenge #80 is "Mi2! Mi2!". Mi2 is a great tangle developed by Mimi Lempart, CZT. Here is Maria's contribution . . .
. . . and her comments. 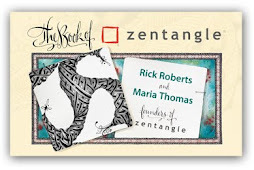 Life is a Zentangle! I love and embrace it as it is. Click this link for some tips on drawing mi2. We recently received this email . . .
Hi guys, Am I a dweeb for wanting to stick with basic tangles? I love the simple, basic designs. The advanced stuff is nice, but I like where I'm at. I feel kinda bad with all the fancy designs on the net and my basic designs aren't anything to write home about, but I like them. 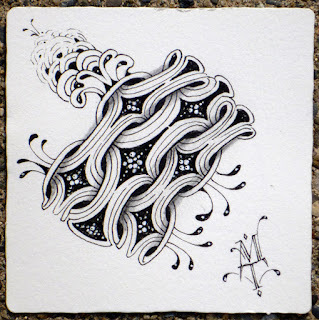 It's impossible to make it into the Who's Who of Zentangle unless my Tangles are over the top. This is discouraging at times. Thank you for writing. This brings up such an important point. 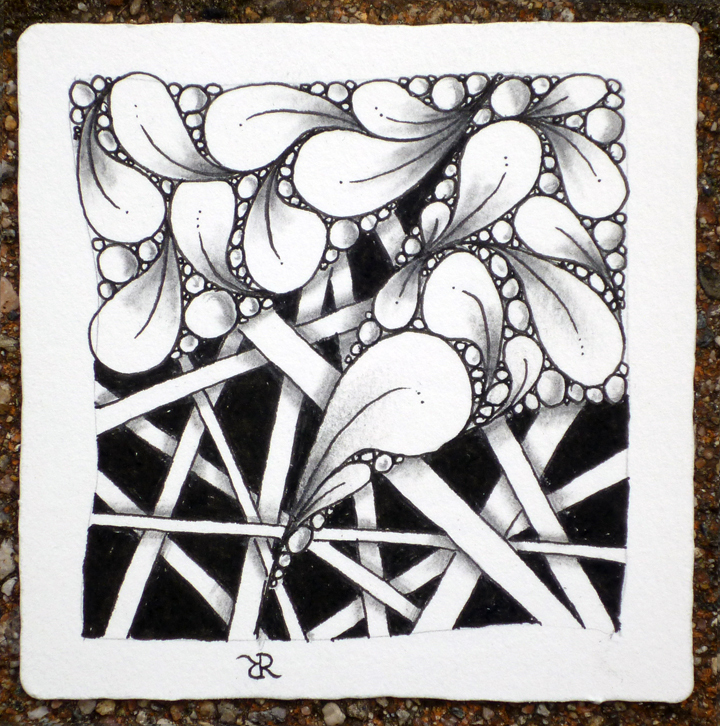 The charm of Zentangle's method is that you can relax into the pleasure of creating "one stroke at a time" without concern for the outcome. We often speak of Zentangle as a practice. We never speak of it as a competition. A useful analogy is reading. Would you enjoy a book better if you could read it faster? Perhaps you could read more books, but at what cost? When you can afford to read at a comfortable pace you can savor a turn of phrase, look up a new word, or gaze into an unfocused distance as you imagine a setting and see yourself in it. It's also relaxing to read an author with whose style and characters you already know and enjoy. It's not necessary to always read a new author on a new subject every time you pick up a book. 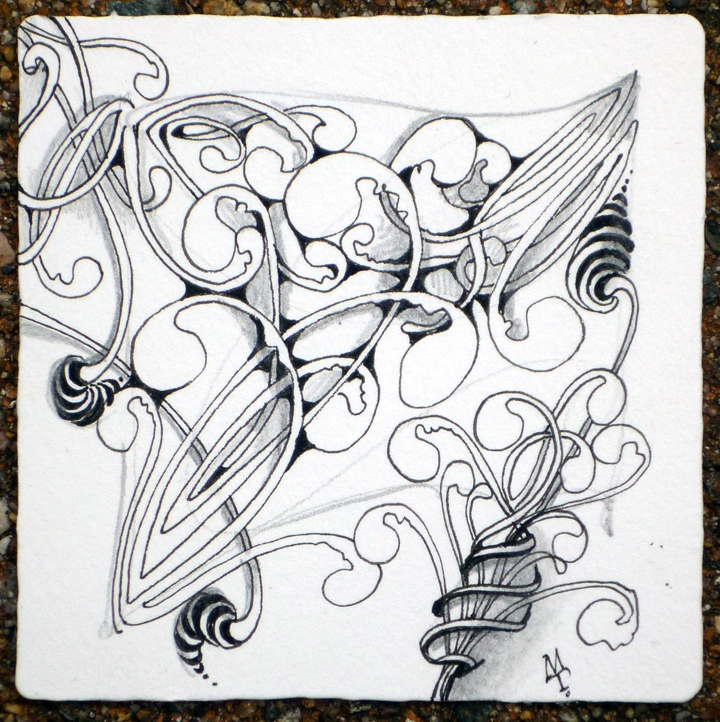 Same with Zentangle. Or a walk in the woods. Or cooking. 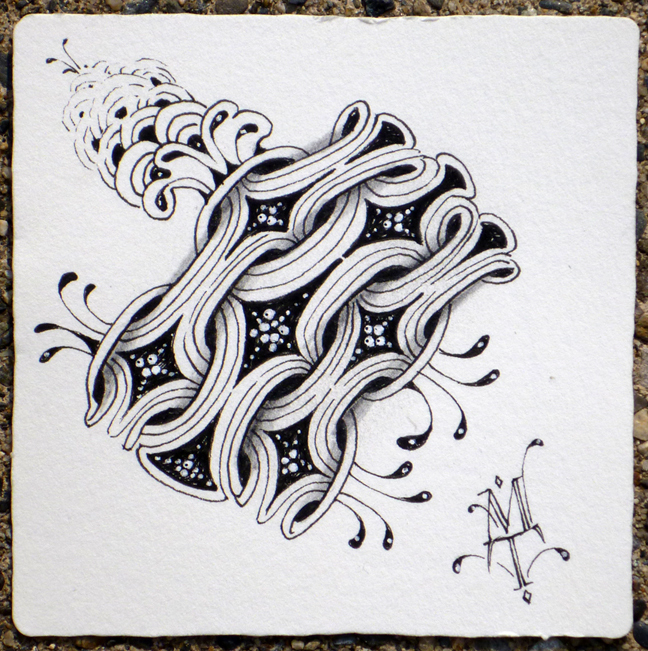 Where is it written that we must constantly strive for more complex and focused tangles? There is something to be said for tried and true, simple and familiar . . . like "mac & cheese" vs. the latest recipe on a food blog. My "mac & cheese" tangle is mooka; Rick's is flux. It's the one I start tangling when I need to draw and not think. Maybe I throw in a bit of poke-leaf sometimes. Every time I draw mooka something morphs. It looks nothing like the original plans I might have had when I began . . . it grabs other tangles and ingests their aspects all on its own. But for me, comfort it is. Rick continues . . .
Maria did mooka; I did flux. It looks like Maria surfed mooka whereas I walked my well-worn flux pathway and added some familiar hollibaugh. We did these independently. After we finished and I saw them together, I remarked to Maria about how many similarities these quite different tiles shared. I did my tile with traditional corner dots, border, and a "Z" shaped string. My flux and hollibaugh almost always look the same from tile to tile. For me, this is part of their charm and why that email struck such a chord. Often my favorite part is shading what I've just tangled but with this tile I most enjoyed coloring in the black behind hollibaugh. Thanks again to the writer of that email for the inspiration to create these tiles and have this conversation. Maria continues . . . I say, draw whatever tangle makes you happy at that moment. 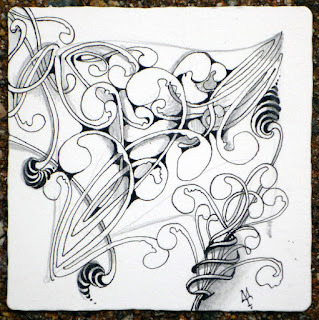 That is the essence of Zentangle, enjoying putting pen to paper one stroke at a time. It feels so good to enjoy that moment without fretting about an outcome or someone else's opinion. So, if you want to learn a new tangle (or explore a new path or try a new food), that's fine. But most times what you want is a comfort tangle; and then, comfort tangles it is! Click images for more basic comfort.